When my publicists began accepting interviews, they were offered for me to appear on many television shows in the UK and USA. I had my publicist made it clear at that time, in 1990, that this was basically going to be impossible, that I felt too overwhelmed by being filmed, wouldn't cope with TV studios, wouldn't cope with applause, wouldn't keep up fluently with the language used to address me, feared I'd be unable to make fluent sense in responding verbally (I felt confident with typed replies, even reading those) or the overhead lights or being handled by make-up artists and the likes, as happens with TV shows. It wasn't until 1992 that the late Peter Jennings flew from the USA to interview me in London, UK for Person of the Week; no lights, no make up, no studios, no audience. We walked around a park as the cameraman ran along in the bushes filming us talking through lapel microphones. In 1993, Edie Magnus, from Eye to Eye with Connie Chung flew to London and drove to Wales to film me. This time it was a studio type setting, in an old Manor House hired for the interview. I had the crew make noises and jump to show their 'real selves' before I would allow them to film me being my self. The crew looked to Edie Magnus perplexed at the request but Edie had them comply. One who was unable to relax and be himself in these tasks was simply banished from the room when I declared that if he couldn't show me his real self, then I felt too invaded and exposed to have him look through a lens and film me being my self (as opposed to my well honed capacity to mimic non-autistic people). The cameraman had to wait outside and the rest of the crew were accepted and filming got underway without problem. The result was that I dared to allow cameras to directly capture me in a TV interview in a studio setting for the first time. In 1995, I agreed to feature in 3 television documentaries. All were filmed in part at my home in Wales at that time and featured what is now my ex-husband (I'm now married to a lovely man, Chris Samuel, who features in my fourth autobiographical work, Everyday Heaven). My father died during the filming of the third documentary and the ex-husband announced he was leaving me the day after our 2nd wedding anniversary and one week after my father's death. It was the documentary crew who stayed with me, stayed filming and held my socially isolated life together in the two weeks that followed, and won my trust of the media from then on. I turned down many offers to appear on television and my appearance on SBS in 2006 in the Insight program "Understanding Autism" is the first time since 1999 that I appeared on television and the first time I appeared on television in my own country. Here is my IMDB page. Midlands Today Evening News where she appeared with her life sized sculpture, <link http://www.donnawilliams.net/Sculptures/LifeSize/>My World, The World</link>. 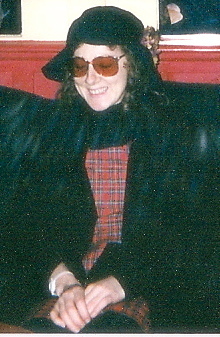 One of a number of guests on a BBC, UK program about autism around 1999. She appeared on the current affairs program, <link http://news.sbs.com.au/insight/>Insight</link>, on SBS, in 2006, her first Australian TV appearance. She appeared on KRNV-TV in Nevada in 2008. In 2008 Donna became a TV interviewer for Visions on Channel 31 TV in Melbourne. She has produced two albums, titled Nobody Nowhere (after the book) and Mutation. Two songs from her first album feature in a Japanese TV series (now with English subtitles), Things You Taught Me (TBS) (IMDB page).